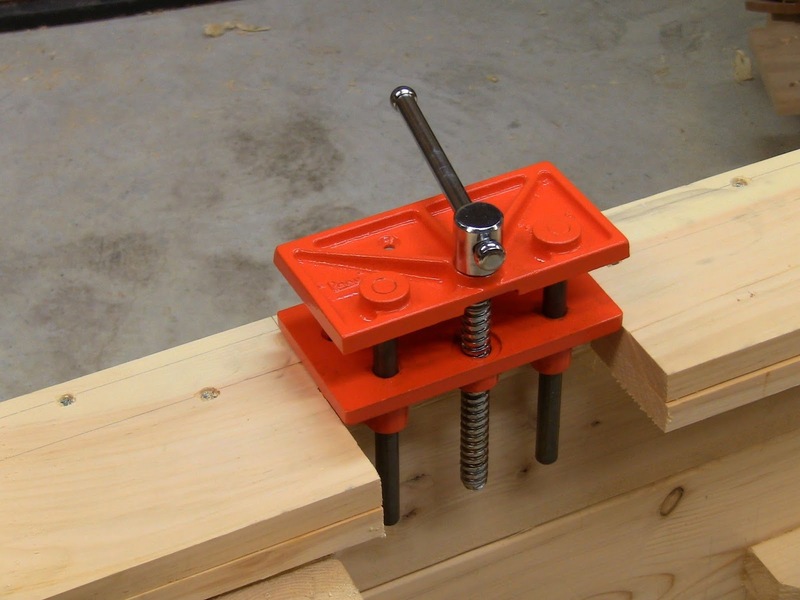 The first thing you'll think about this vise is, "It's so cute!" The second thing is "Will this thing be big enough?" Here again we have to sacrifice a bit in the interest of portability. This is a very simple light duty vise, but it's big enough to do a fair amount of work. It's mounted in a cutout in the apron. The strength of the mounting comes from two wood screws vertically up into the apron and two horizontally into the front of the apron. The mounting procedure I'm showing here will work for the most part with other vises if you choose to use a different one, but each one's a bit different. I can also take advantage of the simple construction and light weight of this one to remove the back plate and mount it separately. That may not be possible with every vise. Some vises will accept large lag screws for the underside mounting, but those are generally too heavy for this bench. I'm mounting it on the left since I'm right-handed. Mount it on the right if you're left-handed. 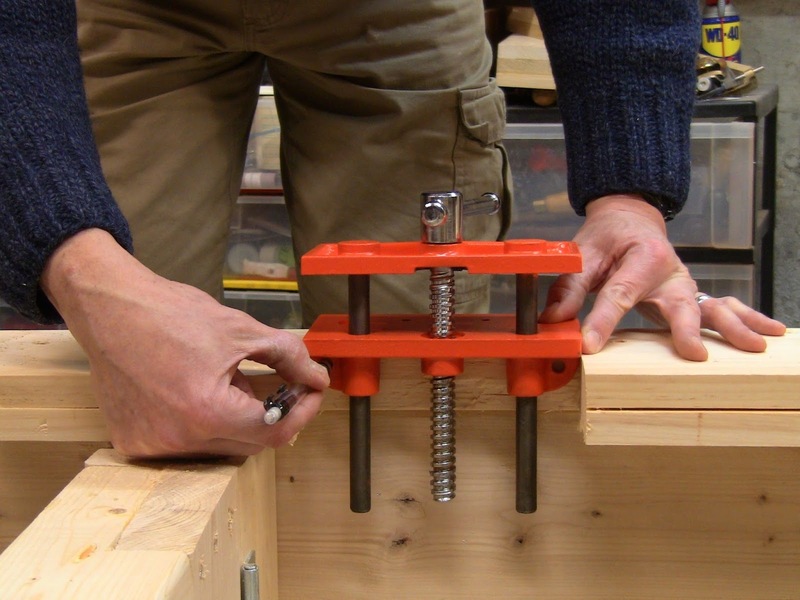 Double check all the layout against your vise. The main thing is you need the guide rods to clear the leg and the underside of the top. 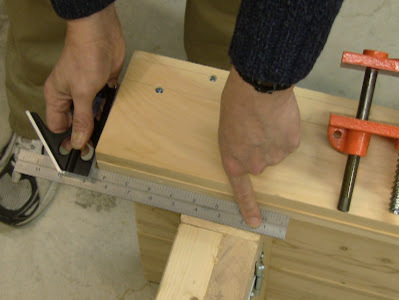 Set the square to measure from the outer edge of the apront to 1" inside the leg. Mark this measurement on the apron front. Rest the vise on the apron with its left side at the mark. Mark the right side. Remove the vise and square these two marks down the front of the apron. Set the square to 1/4" past the thickness of the top. Use it as a guide to run a line at this measurement along the front of the apron between the side lines. Using the same procedure for kerfing and chiseling that you did to notch the lower leg stretchers, saw and clean out the cutout. Set the square to 1" past the inside edge of the leg. Mark this measurement on the front of the apron. 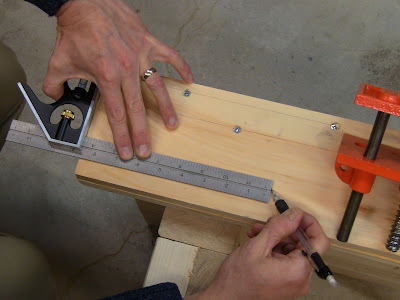 Set the left edge of the vise on this mark and mark the right edge. Square these two marks down the apron. Set the square to 1/4" past the underside of the top. Using the square as a guide, run a line at this measurement between the other two lines. 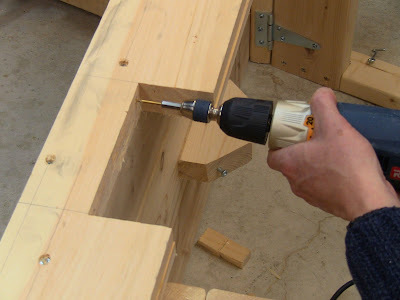 Just like making the legs, saw out kerfs between the side marks to the depth of the line you just marked, then chisel out the waste and chisel it smooth. Set the vise in the recess at its final position. 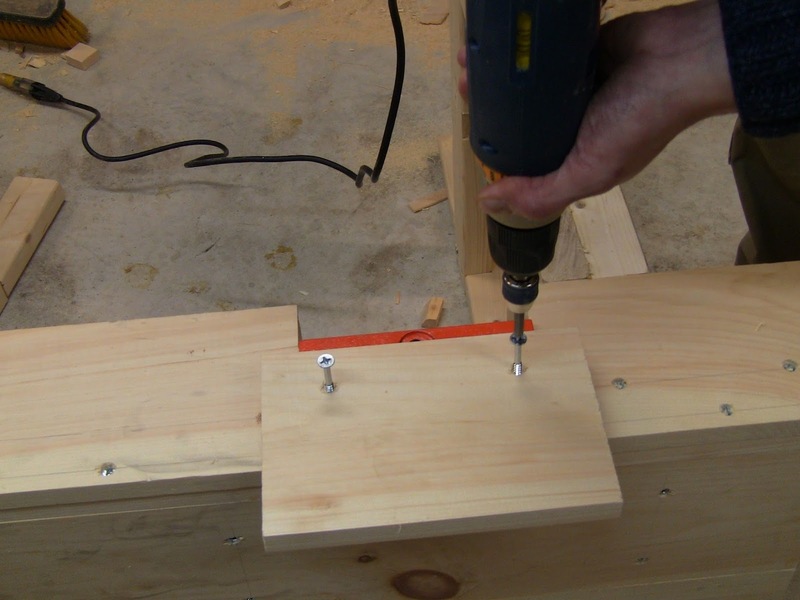 Drill 7/64" pilot holes for #10x2" screws. 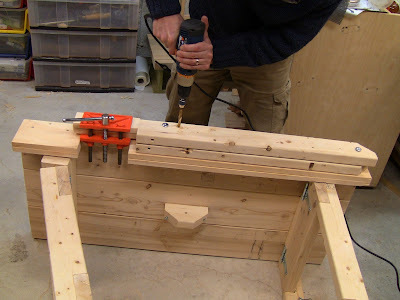 Set the vise in this recess and mark the positions of the screw holes. Here's the position it will be mounted in. Cut two scraps of 1x6 for the vise faces, 8 1/2" long. 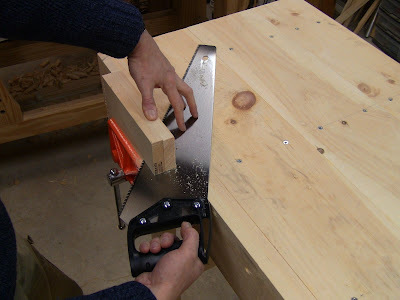 You'll trim these to width once the vise is mounted. In the future you may want to replace these pine faces with more durable hardwood. 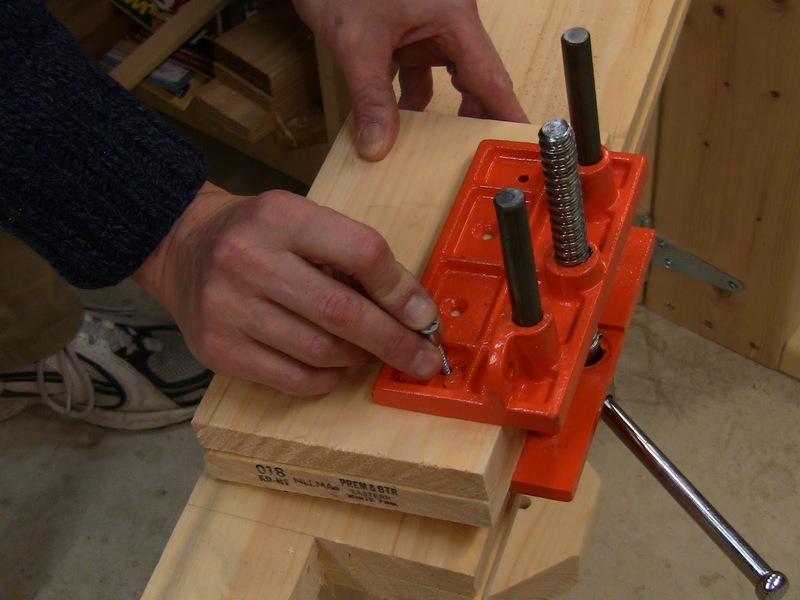 Clamp the pieces in the vise and mark the outer mounting holes in the back face. Drill 3/16" holes in this piece. These are not pilot holes, the screw shanks should slide through them. Counterbore these holes on one side for a #12 screw head. 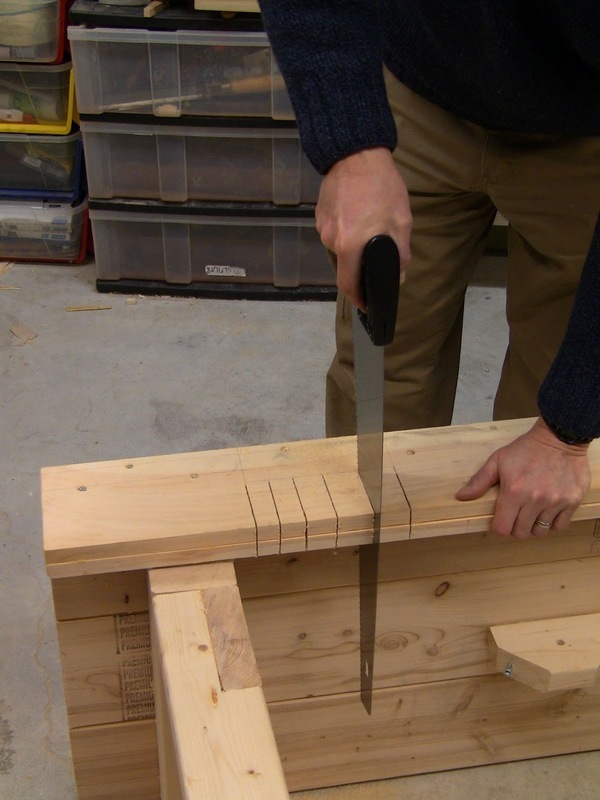 With the wooden jaw faces clamped in the vise, mark the position of the outer mounting holes through the back. Drill and counterbore these holes in one face piece. Unscrew the vise screw all the way so the back plate comes off. Set the plate in position and drive #10x2" screws through the underside mounting holes. 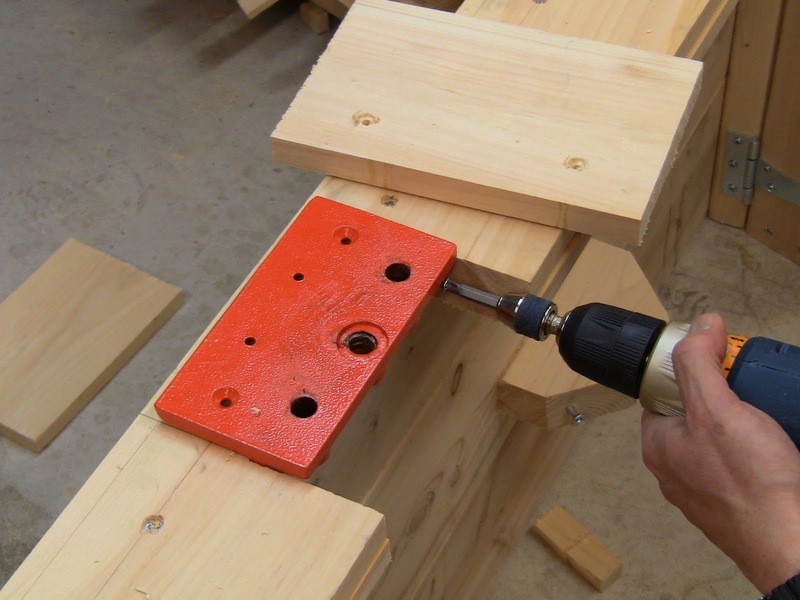 Drill 11/64" pilot holes for #12x3" screws through the outside mounting holes through the apron into the front edge of the top. Place the pre-drilled face piece on the plate, aligning the holes. Drive #12x3" screws in, securing the face piece and the back plate. 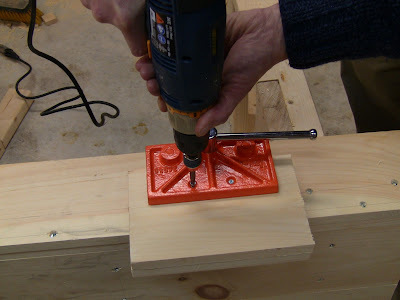 Reattach the front of the vise. Clamp the other face piece in the vise and drive #8x3/4" screws in. Be careful not to overdrive them and strip the holes out. 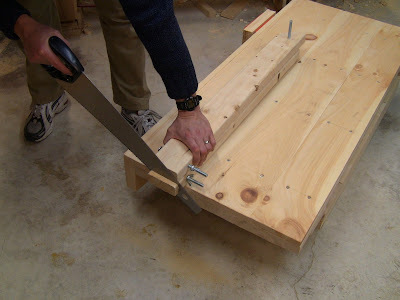 Stand the bench up with the legs secured and saw the face pieces to width, flush with the top surface of the bench. Unwind the screw until the back plate comes off. Drive screws into the underside mounting holes. 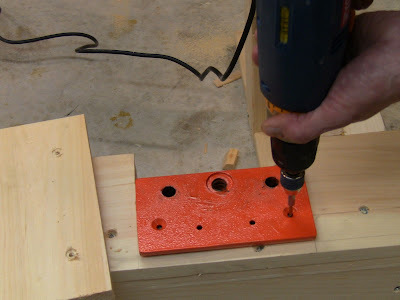 Drill pilot holes for #12x3" screws in the outer mounting holes. Place the drilled face piece over this and drive the screws in. After reattaching the front of the vise, clamp the other face piece in it and drive screws in from the front. Stand the bench up (making sure the leg braces are bolted in place) and saw the excess off the face pieces flush with the top of the bench. The bench ready for use! Trim the leg end of the braces even, leaving 2" of wood from the bolt holes. 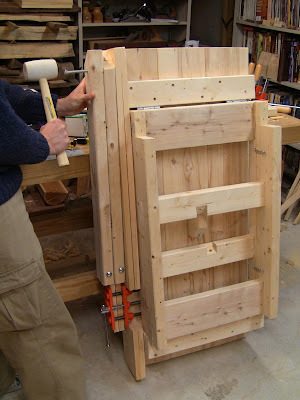 Stand the folded up bench on end and set the braces along the front apron. This is where you will store them. 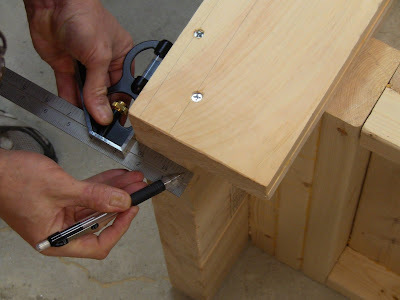 Using the mallet, dimple the front apron with the end of the pivot bolt to mark the position. Drill a 3/8" hole at this point. 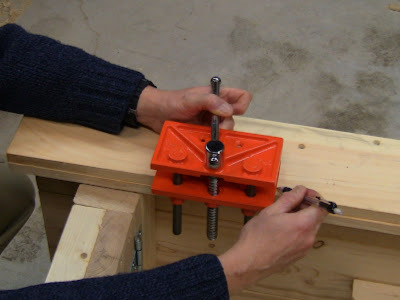 Run the end of the pivot bolt through the apron and secure it loosely with the wing nut. 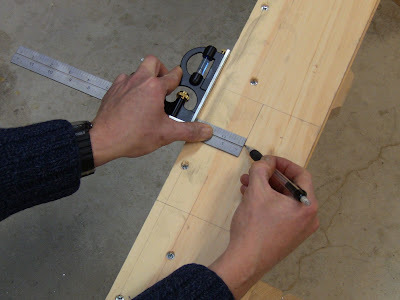 Mark a line on the legs aligned with the ends of the vise guide rods. You know that the rods clear the underside of the top, so this should as well. Drill two 3/8" through the legs and apron along this line. Run the two leg bolts through them and secure with the wing nuts. If there's not enough clearance to spin the nuts, you can redrill the holes a little lower, which doesn't look great, but won't harm anything. 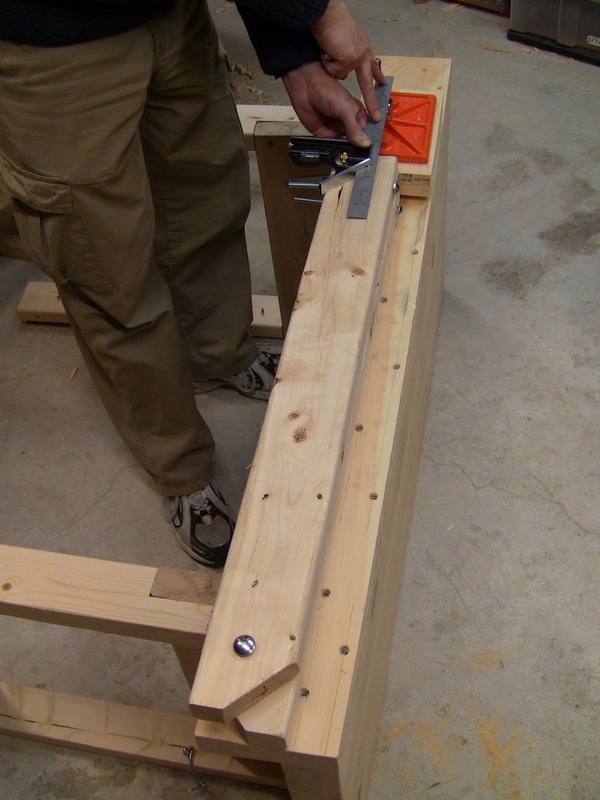 Trim the braces even, leaving 2" from the carriage bolt holes. With the bench on end, hold the legs in storage position next to the vise and dimple the apron with the location of the pivot bolt. Drill this, run the bolt through and spin the wing nut down on it. Mark a line that's aligned with the ends of the vise guide rods on the leg. Drill two bolt holes along this line through the legs and the apron. Run the bolts through and spin the wing nuts down on them. I had to redrill the apron holes a bit to provide clearance to turn the nuts. Sloppy, but it worked. ... or resting flat on the floor. In part 6 we'll deal with getting it to sit flat on any surface and go through some work-holding and usage tips. Look at part 3 of the portable workbench project to see how to use the lightweight bench this was based on. I highly recommend drilling a few 3/4" dog holes with the spade bit and getting a pair of Gramercy Tools holdfasts as shown on the portable workbench. These are specialty items, but well worth it. Don't go crazy with dog holes, drill a few at a time as you find you need them. Steve, I am amazed by your attention to detail with this construction! 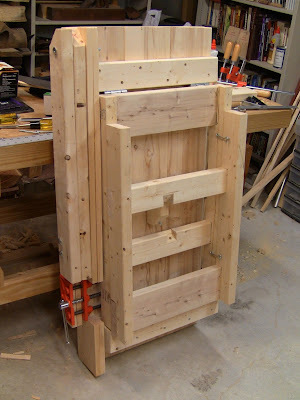 I just came from your Underhill Portable Work Bench build (2010). From what I see, that bench seems more adapted to apartment living than this current rendition. Just looking at the folded size, it should be smaller. I also agonize over handling these brutes. 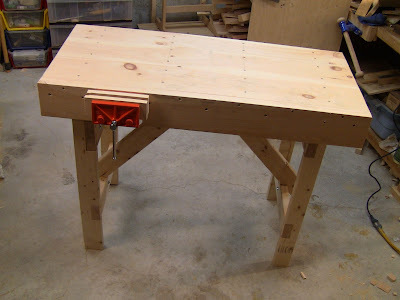 After years of hacking home repairs, and building stuff, I still have no wood working bench. Substitutions have included deck floors, kitchen/dining tables, a driveway, and garage floor. You really don't need the traditional bench, but something does help. Thanks! 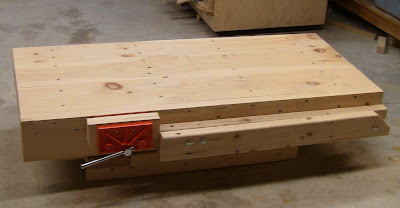 Yes, the Underhill bench actually folds down a bit smaller because it's not made from full 2x4's. Both of them are reasonably luggable; specifically, they can be thrown in the back of a van or car pretty easily. The other thing to remember is that my premise with this one was to be able to build it with minimal skills and minimal additional dimensioning work, using just what's commonly available at Home Depot as is (i.e. 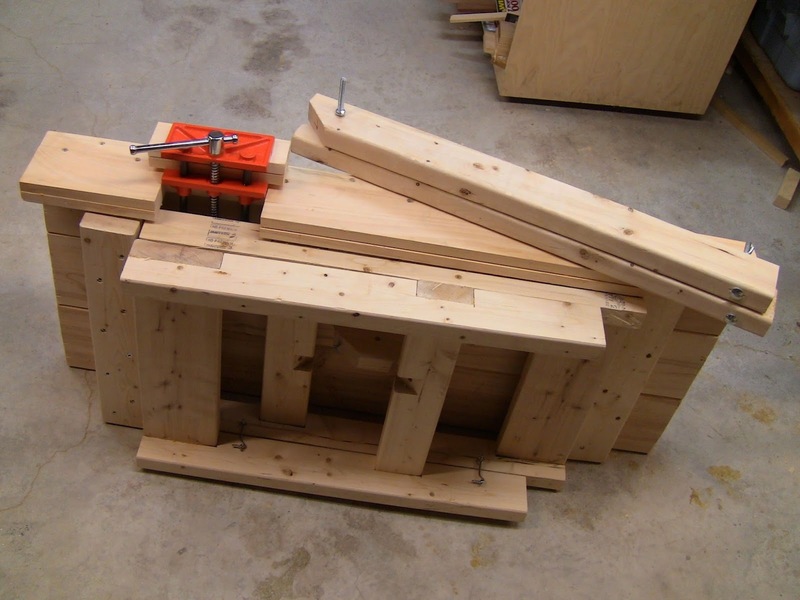 the pre-dimensioned construction lumber). So this one is cruder than the Underhill bench. About how tall is it folded up. I'm trying to gauge what it could slide under for storage when not in use. It's 10 1/2", which is 2 2x4's on edge, plus 2 lying flat, plus a layer of 1x8. The 2x4's are actually 1 1/2" x 3 1/2", and the 1x8 is actually 3/4" thick. It doesn't seem that there is a part 6 linked on this page. Hi Devin, yeah, sorry, I haven't gotten around to doing part 6 yet, but I still have it on the to-do list! Is there another place where you might discuss how to adjust the legs so that the table sits a flat surface? There looks to be some discussion of shims and trimming on the similar portable bench project linked to in this one. I'll be starting this project, this weekend. Looks like fun! No, not yet. I've also changed my original plan. What I'm going to do is cut one of the back legs an inch or 2 shorter, then screw an adjust leg-leveler foot to it. That's a very simple, practical solution. Hi Steve, Would it be alright to use the orthographic imagery you used for the apartment workbench on my university project?. Thanks, Miles.